Camping with Family or Friends needs an ideal tent. If you have not purchased a tent ever and this is your first time then you are at the right place. There are so many tents available in the market such as Ozark Trail Tents are very much popular because of their cheap price and good build quality. But the Coleman Tents have also proven that they are reliable and durable product available at a reasonable price. Coleman is an American manufacturer company which that specializes in Sports Equipment and Outdoor Equipment. Coleman Tents have a good value in the camping industry as they are the stylish and long-lasting product. The Coleman Tents are very much comfortable and offers complete privacy on the camping adventure. There are more than 60 types of Coleman Tent from which you can select the best one for you as per the requirement. The price range of the Coleman Tent starts from $33.99 to $399.99 and the size range starts from 28 sq. ft to 170 sq. ft. While choosing a tent, it is very much important to understand the number of campers and space. The company manufactures different types of tents in order to meet the need as well as the preference of the customers. 2 Final Conclusion – Still Confuse Which One to Choose? Below you will find the products from Coleman which are famous in the market due to its solid design, protective features, and premium build quality. 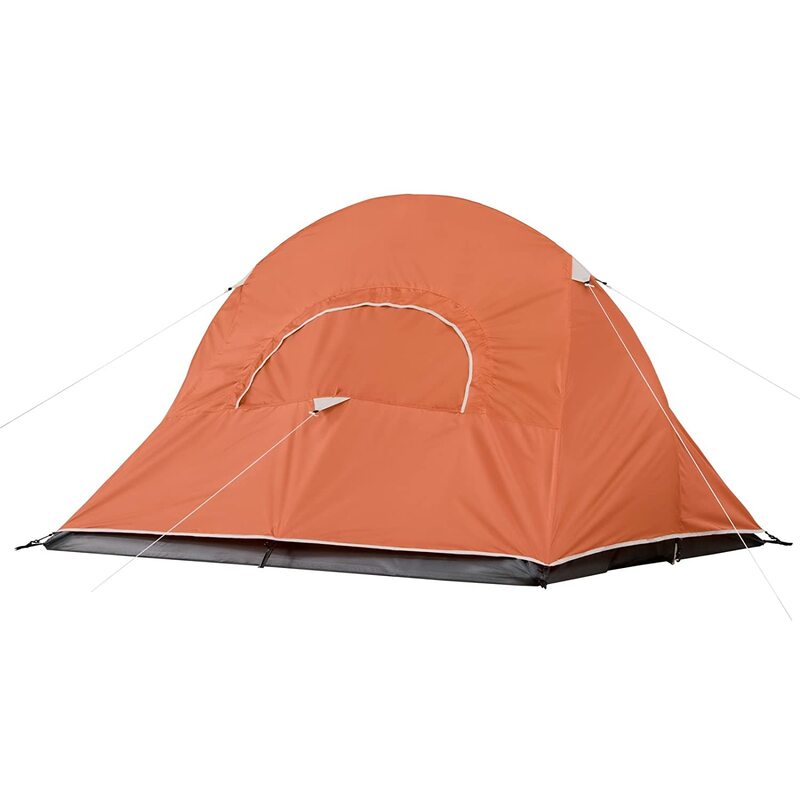 This Coleman Sundome Dome Tent is the best option if there are two persons on camping. Although it looks compact, it is spacious and takes 10 minutes for installation. It has 2 large size windows and a ground vent for good ventilation. Coleman Sundome Dome Tent comes with Weather Tec system which uses a tub floor with patented corner welds, covered zipper and protected seams which helps in keeping the water out during the rainy season. Heavy Duty TC Fabric has been used for the construction of Coleman Sundome 2 Man Dome Tent which makes it a long-lasting product. The room of Coleman 2 Person Tent can fit a queen sized bed which is spacious enough for two campers. It is incorporated with 8.5 mm fiberglass pole and 52 inches (132.08 cm) height at the center. Electric ports are available in two Person Coleman Sundome Dome Tent so that you can use the electrical equipment. The floor is 1000D polyethylene in bathtub style for your safety and protection. 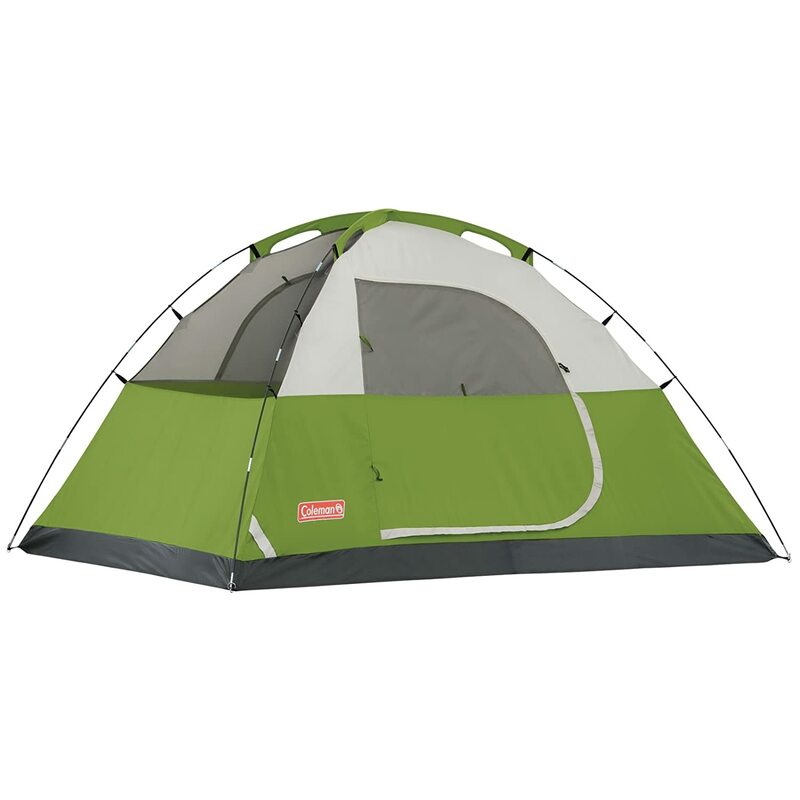 You can avail this Coleman Sundome Dome Tent for 2 people at the cheap price of $34.00 only. Shade & Rain Protection because of Rainfly Awning. Difficulty in packing the tent inside the bag. Coleman Hooligan 2 Man Tent is a lightweight backpacking tent so you don’t have to worry about the weight of your backpack. It has an inbuilt flashlight loop which makes it super easy for you to set up your lamp or fan. This Coleman 2 Person Hooligan Tent has a small vestibule in the front which makes some extra storage space. 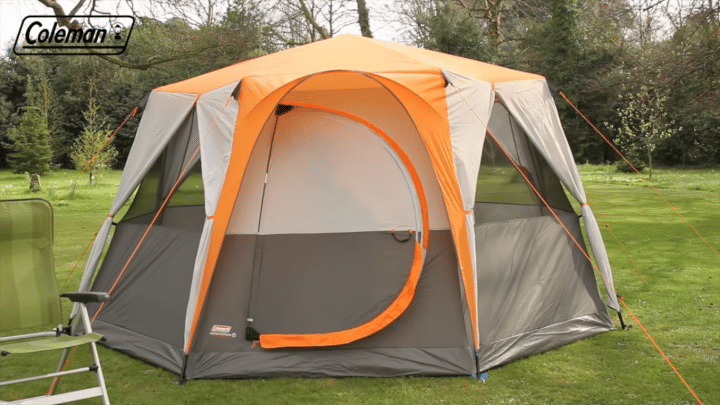 This tent is very easy to install because of its pin and ring pole to body connection. Coleman Hooligan Tent for 2 Persons has interior storage pocket which can be used to keep the camping gears. The floor is of bathtub style made up of 1000d polyethylene wraps up from the sides. It has welded seams in the corners to prevent the leakage and it is wind & waterproof tent. Its 1 Pole design makes it simple to set up and then take down. This 4 Man Coleman Instant Tent measures 8 x 7 feet (2.13 meters) with 4 foot 11 inch (27.94 cm) center height. This is the good choice for four person camping and is easy to carry as its weight is only 18 pounds (8.16 kilogram). It is very easy to set up Coleman Instant 4 Man Tent because it comes with pre-attached poles that help in setting up the camp as simple as unfolding, extending and securing. It will take about 1 minute to install the Coleman 4 Person Tent. 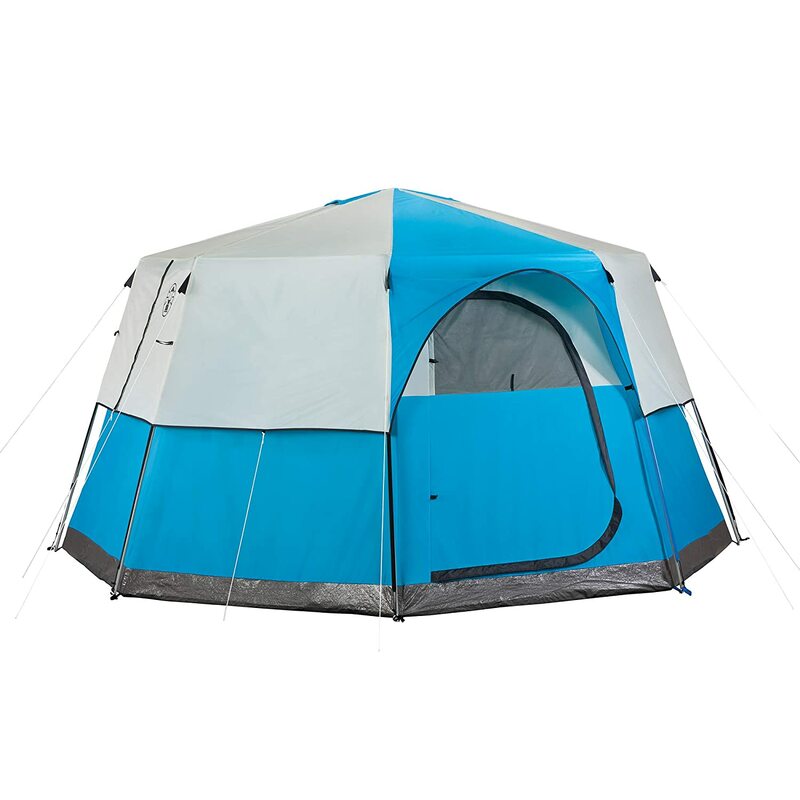 The tent is durable as it is made up of rugged Polyguard 2X double thick fabric. The WeathertTec System features patented welded floors and inverted seams which will prevent the rain water from entering inside the shelter. Rainfly has been added in the Coleman 4 Person Instant Tent which improves the airflow and ensures that rain water won’t spoil your camping. The Dark Room Technology blocks 90% of the sunlight coming into the 4 Person Coleman Instant Tent. It can be incorporated with 1 queen size airbed which is enough for four people. The availability of Small pocket in Coleman 4 Man Tent helps in keeping the things organized. Quality of stakes is not good. Coleman Sundome 4 Man Dome Tent takes only 10 minutes to set up because of continuous pole sleeves. This Tent is incorporated with large windows and ground vent which maintain decent ventilation inside the tent. 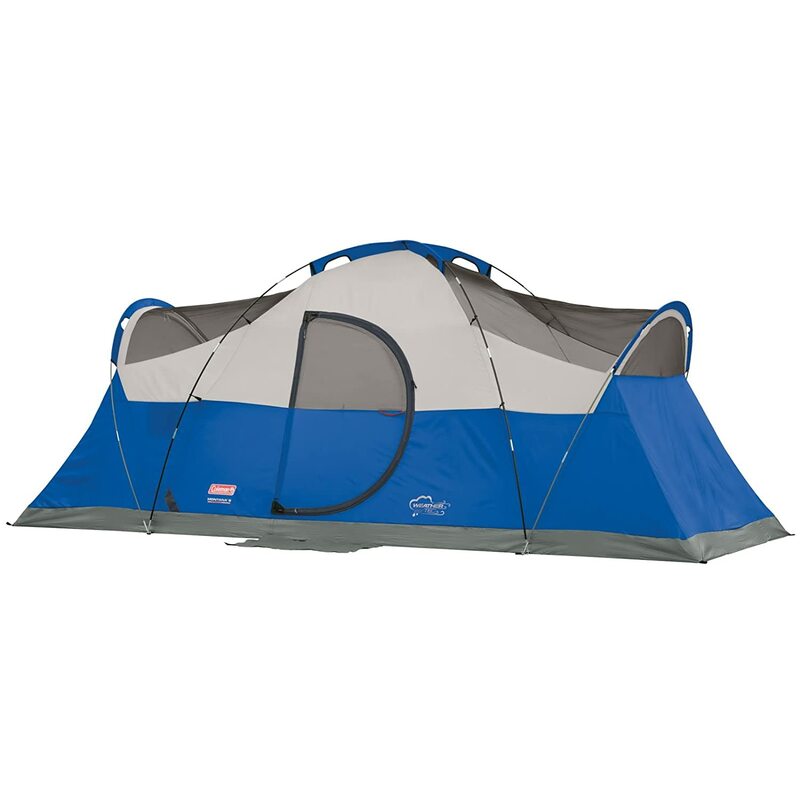 4 Person Coleman Sundome Tent is good for camping in warm weather which keeps you comfortable. The measurement of Coleman 4 man tent is 9 x 7 feet (213.36 cm) with 4 foot 11 inches (27.94 cm) center height is spacious enough which allows you to move easily. 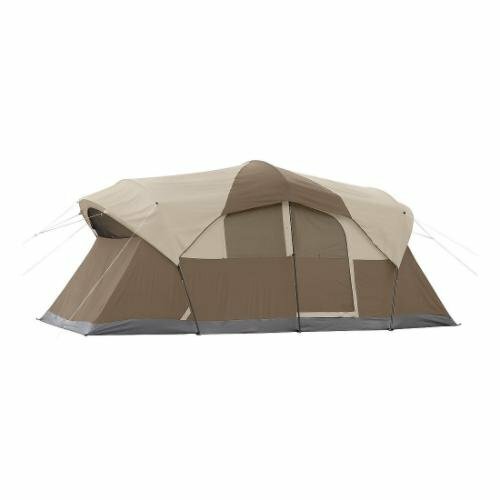 Coleman Sundome 4 Man Dome Tent comes with WeatherTec system with the welded floor and inverted seams will not allow the rain water to come inside and keeps you dry. The availability of Insta-Clip Pole attachments allows the 4 Man Coleman Sundome Dome Tent to stand still in wind up to 35 mph (56.33 km/h). You can place the camping gears organized in built-in storage pockets. Coleman 4 Person Dome Tent offers enough room for one queen size air mattress and E-port makes it easy for the campers to bring electrical power inside the tent. With all such features, the product is available at a reasonable price that is $63.99. If you are looking for a 4 Person Tent in affordable Price then Coleman Moraine Park 4 Man Tent is the best option for you. This 4 Man Coleman Moraine Park Fast Pitch Dome Tent is made up of the highest quality material and has a secured base. It has Rain Fly which will not allow the water to come inside the shelter. Coleman 4 Person Moraine Park Tent has good interior space for 4 people if only sleeping. It is very easy to install as well as assemble the tent and will take about 10 minutes to set up with 2 people. The floor is of bathtub type which prevents the leakage and there is a loop available at the ceiling for hanging a fan or light. Electric Cords are available in Coleman Moraine Park Tent so that the campers can use the electrical devices conveniently. There are 2 Side Pockets near the floor in which camping gears can be placed easily. Stand Still in Wind of 40 mph (64.37 km/h). Rainfly included and Easy Set Up and Break Down. Cannot withstand in high-speed wind. Coleman Instant 4 Man Cabin is made up of Polyester material and is spacious enough to fit 1 queen size airbed. The campers can hold the camping stuff in the little mesh pockets available in Coleman 4 Person Instant Cabin. In fact, Coleman 4 Man Cabin can be installed in 1 minute and it is easy to assemble it as well. Coleman Instant Person Cabin for 4 Person comes with 1 Year Warranty from the company Coleman so that it can be repaired for free if damaged within 1 year of purchase. WeatherTec System’s patented welded floor and inverted seams prevent the water from coming inside the shelter. Coleman 4 Man Instant Cabin has 4’10” height at the center and has built-in vented rainfly for extra weather protection. The pre assembled poles help the user in saving the installation and assembling time. It has Illumiline reflective guy lines for greater visibility at night. Pre-assembled poles for fast and easy setup. The quality of poles may disappoint you. 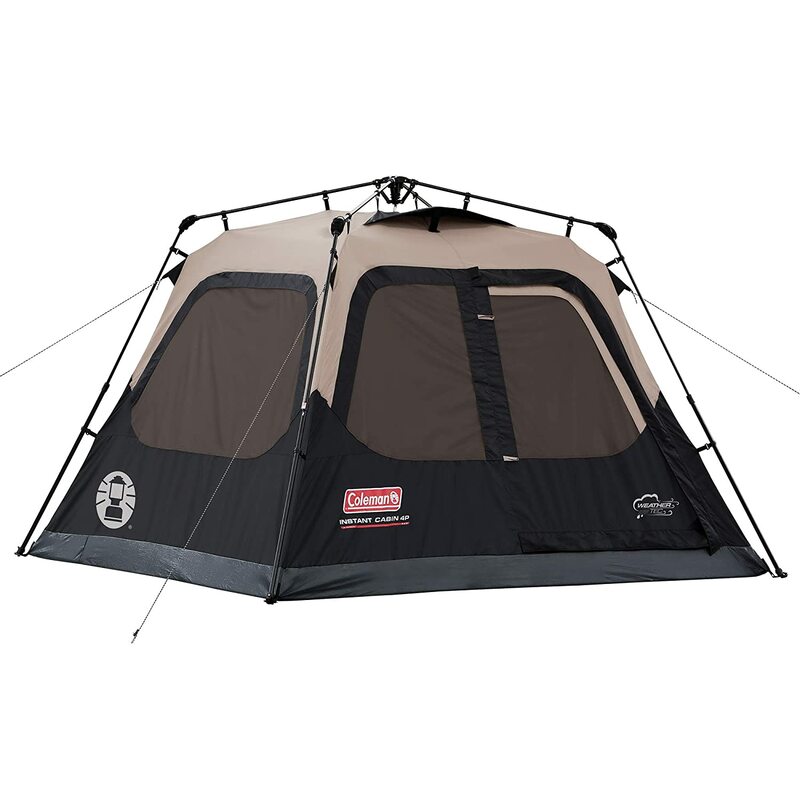 This Coleman 6 Person Weathermaster tent can be divided into 2 room with the help of zipper curtain. So there will be one main room for sleeping and a mesh screened room. In the sun room, the campers can relax and enjoy the sun light. The continuous pole sleeves, patented slip-proof pin and ring system makes the installation very easy & and it takes about 20 minutes. The sleeping room has 11 ft. x 9 ft. space and can fit 2 queen size airbeds and the sun room has 9 ft. x 6 ft (1.83 m). space which offers bug-free lounging. Coleman 6 Man Weathermaster tent has E-Port which helps in bringing the electrical power inside the tent. Storage pockets are available in the Coleman Weathermaster 6 Man Tent so that the campers can organize the camping gears. Coleman Weathermaster tent for 6 Persons is incorporated with hinged door for easy entry and exit & angled windows keep rain out even in a downpour. Easy setup with Insta Clip pole attachments. Hinged door for easy entry. It is not a low budget tent. The Coleman Instant Tent for 6 Persons is made up of 150 D/150 D Polyester and has taped steams. The rugged polyguard 2X thick fabric has been used for reliable and long-lasting use. 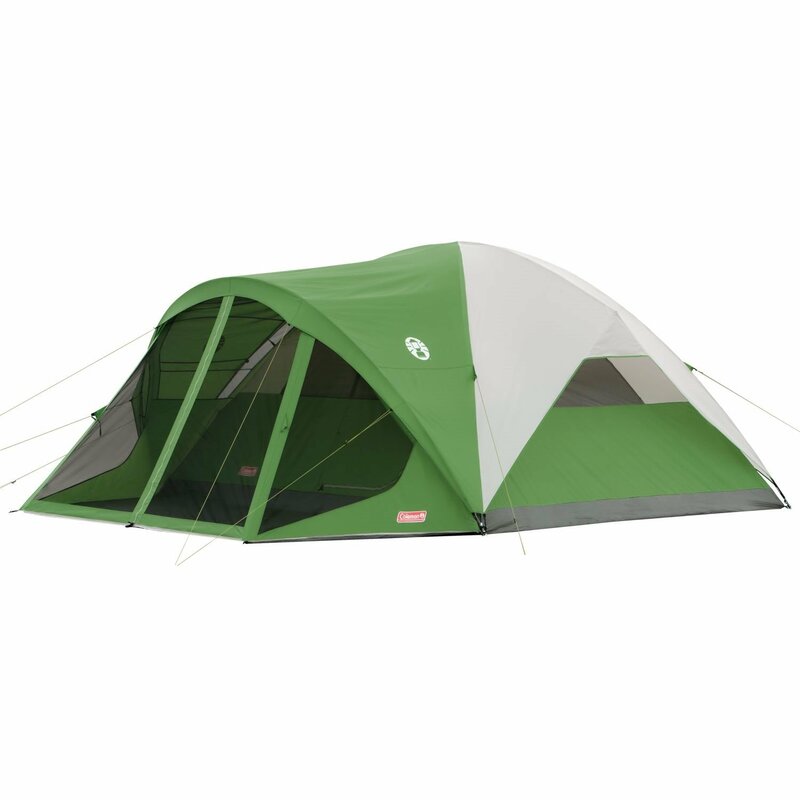 Coleman Instant 6 Man Tent has integrated vented rainfly which improves airflow without the need of any extra assembly. The measurement of 6 Person Coleman Instant Tent is 10 x 9 feet (2.74 meters) with 6-foot center height. The dark room technology in Coleman Instant tent for 6 People block 90% sunlight & reduces temperature buildup up to 10%. It takes about 1 minute to set up Coleman Instant Tent for 6 Man and the interior is spacious enough to fit 2 queen size airbeds. It comes in an expandable carrying bag in which Coleman Instant Tent can be kept safely until heading for the next adventure. Coleman 6 man Instant Tent has a tub-like floor with patented corner welds and covered seams which keeps the water out. Fast Pitching Tent, Good Space. Quality of stakes may disappoint you. 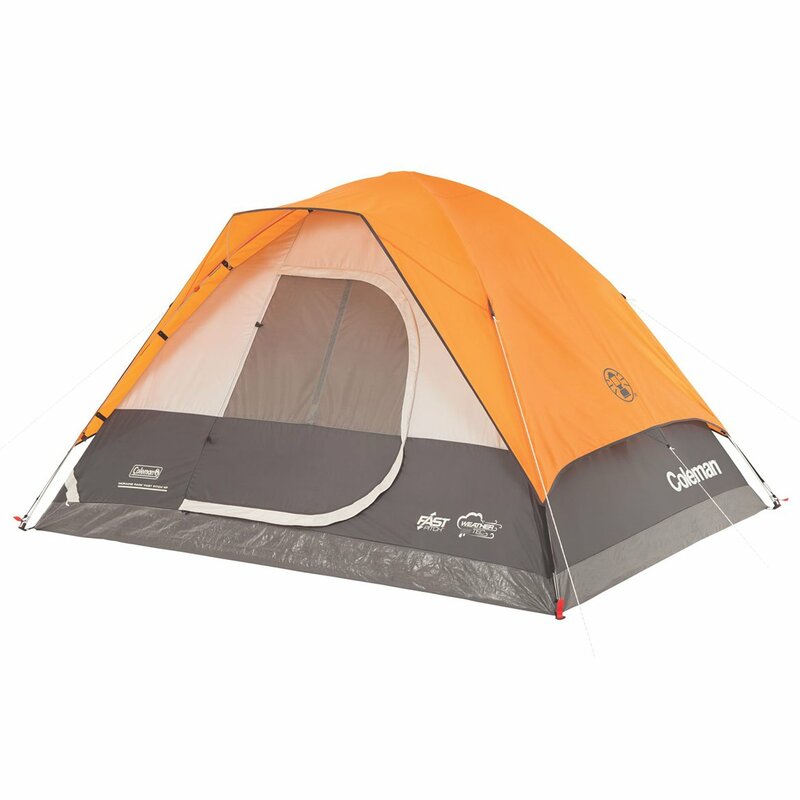 Coleman Carlsbad Screen Room 6 Man Tent has separate sleeping room as well as screen room. The campers can use the screen room for insect free lounging and extra sleeping space. The 6 Person Coleman Carlsbad Screen Room Tent can be installed in about 7 minutes. Durable Polyguard Fabric and Strong Frame Design makes the Coleman Carlsbad 6 Man Screen Room Tent long-lasting. The tent can fit 2 queen sized airbeds and has 5 foot 8 inch (0.2 m) center height. Side Pockets availability in the Coleman Carlsbad Tent for 6 Persons helps in keeping the camping gears in organized way. The dark room technology prevents 90% of the sunlight entering inside the Coleman Tent for 6 Person and hence reduces the heat in the tent. The WeatherTec System with its tub-like floor, patented corner welds and protected seams keeps the tent dry in rainy season. Dark Room Technology prevents 90% sunlight. Dark Room technology and WeatherTec system used. Quality of poles may disappoint you. The dark room technology used in Coleman Sundome 6 Man Dark Tent blocks 90% of the sunlight and keeps the temprature low inside the tent. 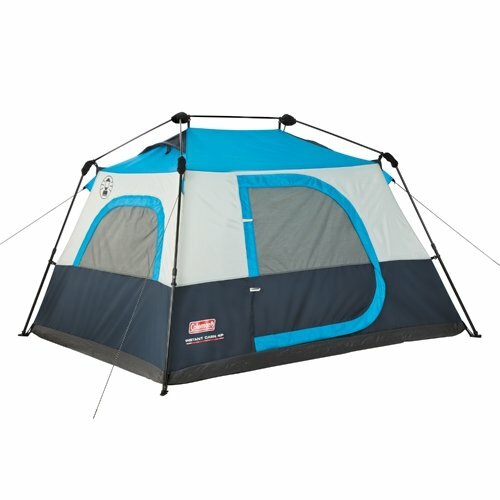 It makes the 6 Person Coleman Sundome Tent comfortable for sleep at night. You can use the electrical appliances as well using the E-Ports available in Coleman Sundome Tent for 6 Persons. 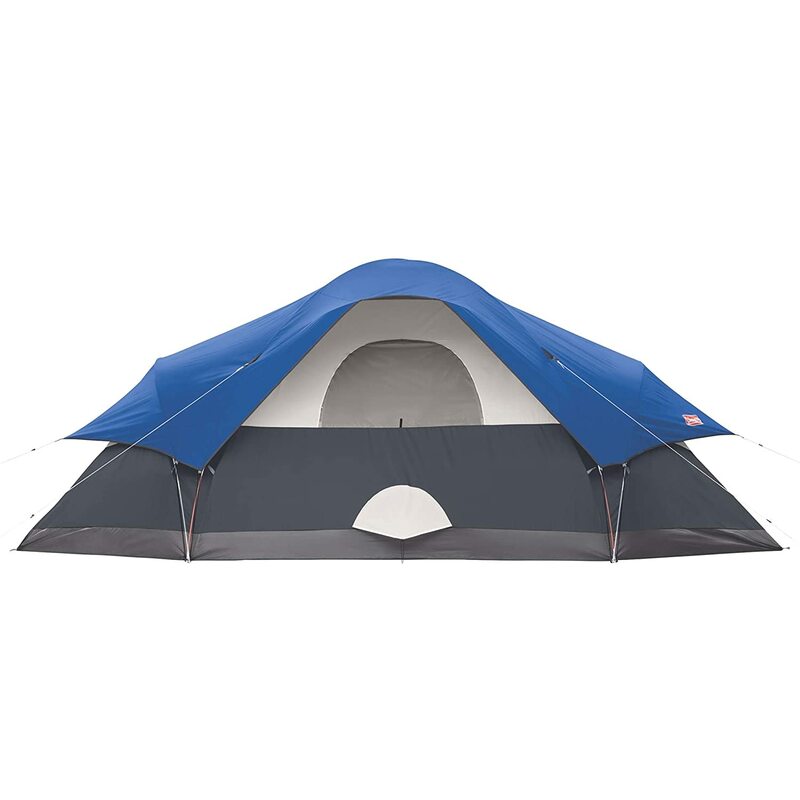 Coleman 6 Man Sundome Dark Tent with strong Frame is tested to withstand 35+ mph wind. With 10 x 10 feet (3.05 meters) space and 6 feet (1.83 meters) center height, Coleman Sundome Dark Tent is spacious enough to fit 2 Queen size airbeds. The tent will remain dry in rainy season because of WeatherTec System with its tub-like floor, patented corner welds and protected seams. Insta-Clip suspensions lets you secure the Coleman 6 Man Darkroom Tent to its leg poles in a snap. Pack Up with ease in the carry bag. Coleman Octagon 98 Tent for 8 Person is the great option for long camping adventures as it has good storage capacity and the material is durable. There are two doors at the either side of 8 Person Coleman Octagon 98 tent for entry. Coleman 8 Person Octagon Tent can be set up and assemble in about 15 minutes. The weight of this tent is 18.6 Kg which is quite more but all the other products having same occupancy are of almost same weight. Hence, the weight of the Coleman Octagon 8 Man Tent is not an issue. The interior space of Coleman Octagon 98 Tent for 8 Man can fit 2 queen size airbed or 8 people along with their sleeping bags. The WeatherTec system patented welded floor and inverted seams prevents the water and keeps you dry. 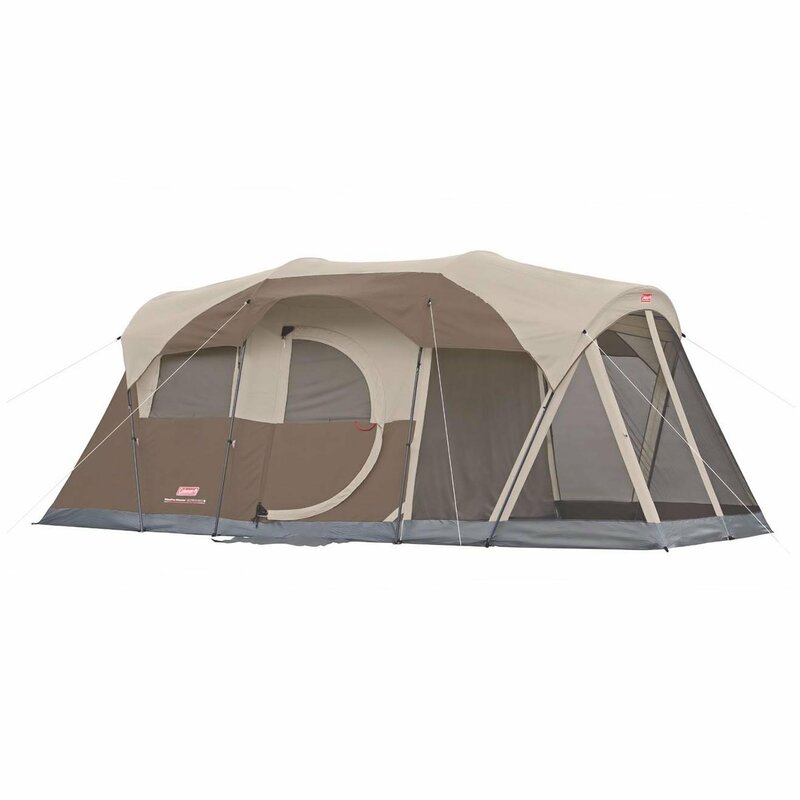 It comes with the privacy wall to create separate rooms hence Coleman Octagon 8 person Tent maintains the privacy as well. You can place the camping gears in the two inner storage pockets available in Coleman 8 Person Octagon 98 Tent. The floor material is thin. It is very easy to set up and assemble Coleman Evanston Screened Tent for 8 Man. In order to get decent ventilation in hot summer nights, you just have to off the rain fly. Coleman 8 Person Evanston Screened Tent will stand still in 20-30 mph wind and it is already tested. The availability of 4 large windows will provide extra ventilation and keeps the inside of 8 Person Coleman Evanston Screened Tent airy and breathable. The center height is 68 inches (1.73 m) and fits 2 queen size airbeds within the area of 14 x 10 feet (3.05 m). Fully Screened Front Porch in Coleman 8 Man Evanston Screened Tent keeps the bugs out. It is a lightweight tent which can be carried very easily at any place. You can maintain the privacy by using the zipper walls available in 8 Man Coleman Evanston Screened Tent. The tent is quite heavy. This tent is made up of 150D material which make it last long and is easy to set up and assemble it. Coleman 8 Person Instant Tent is externally framed hence you need to unfold and extend all the poles & lock them into position. Coleman Instant 8 Man Tent is spacious enough to fit 2 queen size air bed so the campers can sleep easily. 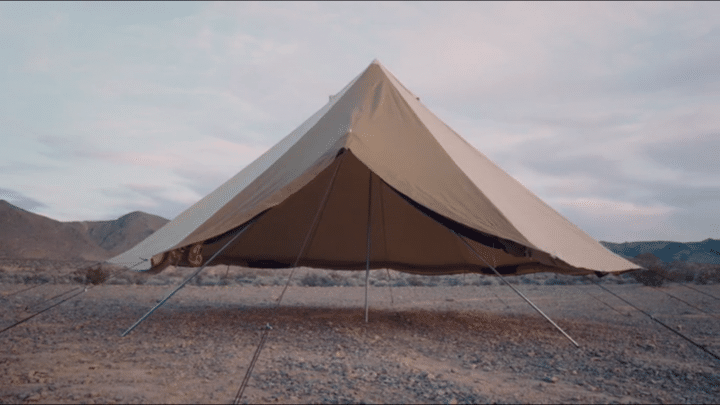 The floors of 8 Man Coleman Instant Tent are waterproof because Welding-inspired technology strengthen the tent floor and eliminate the needle holes. 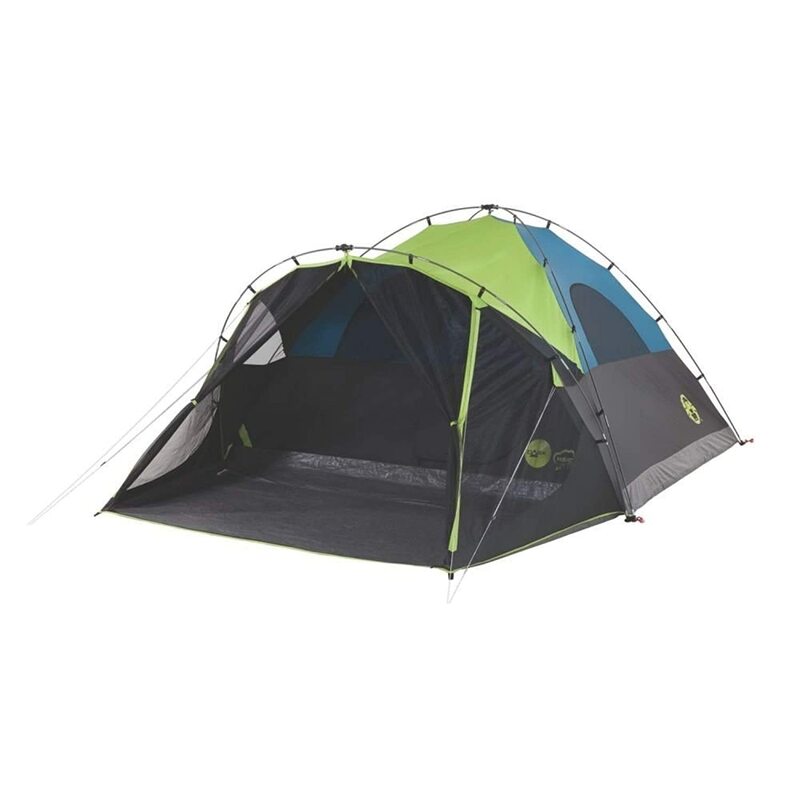 Coleman Instant Tent for 8 Person comes with Wind Strong Frame which makes it stand still in stronger winds. The Zipper Cuff is made up of weather resistant fabrics and provides protection from the outside elements. The measurement of 8 Man Instant Coleman Tent is 14 x 10 feet (3.05 m) with 6’5” center height. So this product would be the great choice for camping with 6-8 person and keep them safe in all weather condition. The availability of large windows and doors in the Coleman Instant Tent will keep the bugs out. The design places too much stress on poles. The Montana Tent by Coleman for 8 Persons has 16 x 7 feet (213.36 cm) space and hence it is a better option when you are camping with eight people. It is a one room tent with 74 inches (187.96 cm) center height and 11-millimeter fiberglass poles. Coleman Montana 8 Man Tent has modified dome structure and is very simple to set up. The availability of Electrical Access Ports in 8 Person Coleman Elite Montana Tent allows the campers to use the electrical devices. The tent can fit 3 queen size airbeds which is enough for eight person to sleep. It would take approximately 15 minutes to set up because of snag free continuous pole sleeves, snag free insta clip suspension and patented pin-&-ring system. Coleman 8 Man Montana Tent is incorporated with 75-denier polyester taffeta fly, 68-denier polyester mesh inner tent and 1000-denier polyethylene floor. 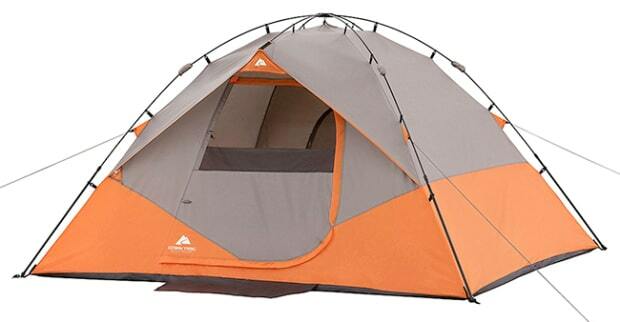 The product comes with 1 year warranty and Coleman Elite Montana Tent for 8 Persons is a Made in China product. The WeatherTec System – patented welded floors and inverted seams keeps the water out. After, the sun set you can light up six in-built CPX LED lights which will keep the party going on. The quality of the poles may disappoint you. This Coleman Weather Master 10 Man Tent has hinged door so that the campers can move in and out easily. It is made up of the Polyester Taffeta 75 D material so it will be a long-lasting product. The rainfly is available to protect from bad weather whereas the mesh allows sufficient sunlight to enter inside the Coleman Weather Master Hinged Door Tent for 8 Persons. Its 17 feet (5.18 meters) x 5 feet (152.4 cm) space allows to fit 3 queen size airbeds which is sufficient for 8-10 persons to sleep. The WeatherTec System of 10 Person Coleman Weather Master Tent will keep the interior dry in the rainy season. It has two rooms with 80 inches (2.03 meters) center height which is sufficient for 10 person. 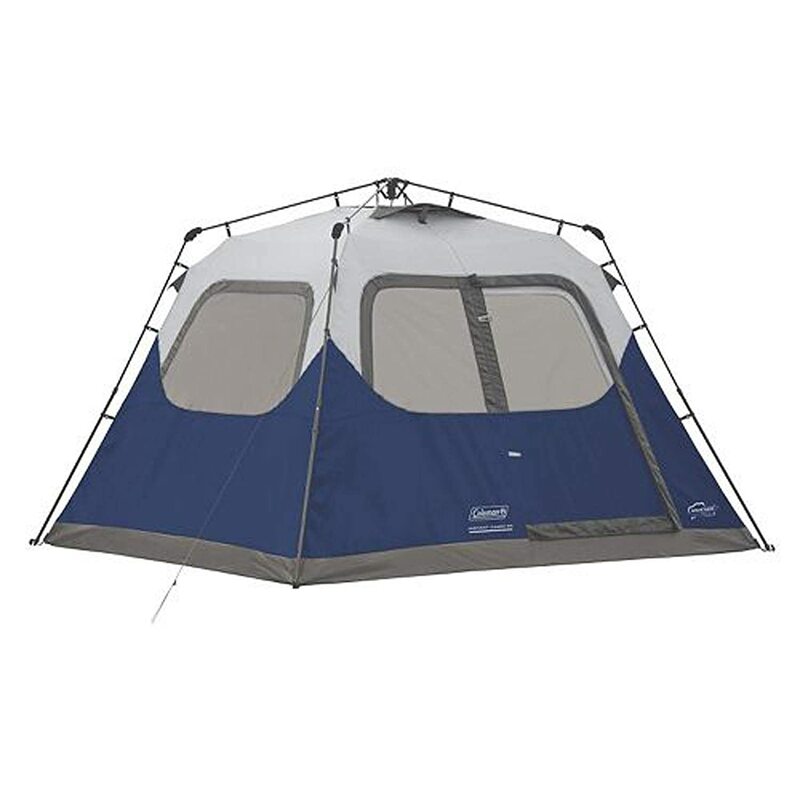 Coleman Weather Master Tent for 10 Man has 2 doors and 2 windows which will maintain the privacy. The Coleman 10 Person Weather Master Tent is made up of strong steel and fiberglass frame which will make the tent stand still in the bad weather conditions. Final Conclusion – Still Confuse Which One to Choose? Coleman Sundome Dome Tent. The tent can be set up in very less time with an ease. The electrical access port comes in zippered pocket and vented cool air port keeps the interior fresh all time. The tent has the enough space to fit three person if you carry less gears with you. So, this is the best tent for two person camping. Coleman Instant 4 Man Tent is the best option for the group having four person. This tent has Dark Room Technology which blocks 90% of the sunlight and maintain the darkness inside. The WeatherTec System keeps you safe and dry from the rain water and high quality fabric makes it durable. All these features of this tent makes it different than the remaining other tents of same occupancy. Although, the tent weight of tent is slightly more than others but rest of the things are awesome. If you talk about a tent which is best suited for 6 Person then I will recommend you to buy Coleman Weathermaster tent. Its 9 ft. x 6 ft (1.83 m) bug-free lounging space makes it unique from the other tents. Apart from this, the tent features Waterproof Floors, Hinged door for easy entry, Instant Clip pole attachments for quick set up and can withstand in heavy wind. So this is the product which you should buy without having any second thought in your mind. For the occupancy of 8 person, I would suggest to go for Coleman Montana Tent. The reasons are it has extended door awning space and six in-built CPX LED lights will light up the tent after sun set. It weighs only 22.3 pounds (10.12 kg) which is less than other 8 person tents.